Once he learned a bit more about me and my health history, we began treatment. Cupping was used to extract coagulated blood and toxins that were forming between my discs and around the inflamed area, which was such a crazy concept to me when he explained it. He first takes little needles and pokes holes in my back so that the suction cups can pull from my skin more easily. Then the cups go on for about 10 minutes, and then he wipes clean what's been extracted. I believe I had about 6 cups placed along my lower back on either side. Then he went back with acupuncture needles from my neck all down to my lower back and upper bum. They just feel like a tiny little pinch, you can barely feel it. It's like a hot little sensation and only for a quick second. Only once or twice did I start feeling itchy while laying there with the needles in. He has music playing and the lights dim so it's very relaxing. After about 20 minutes, he comes back in and removes the needles. When I got up, I felt very relaxed and "zen" which I didn't expect to feel. I could definitely tell that there was some sort of relief in my back too, though I'm still experiencing pain. I've only had one visit and I completely understand that nothing is a quick fix. It has gotten better though over the last week and I'm excited to see what the next week looks like after seeing him again tomorrow. I'll fill you in on my Instagram stories! 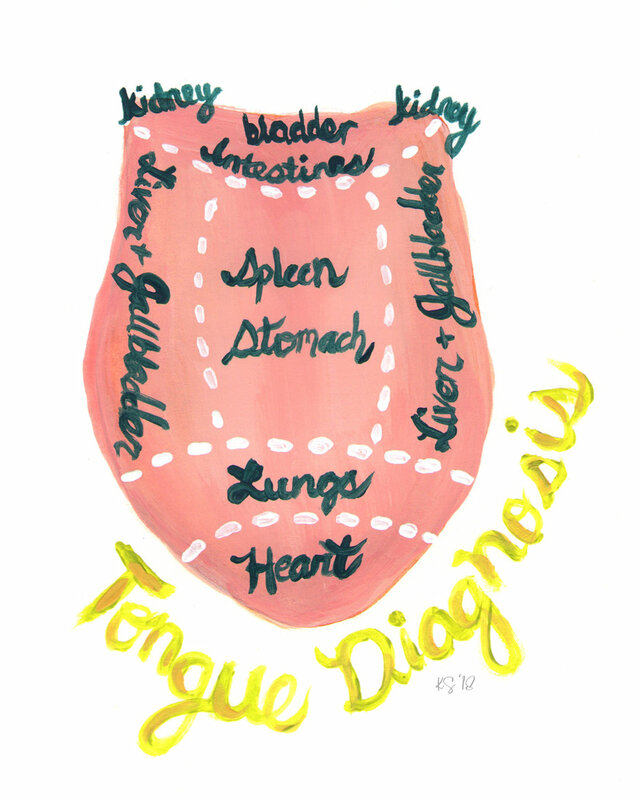 So a bit about this Tongue Mapping stuff... Our tongues are major indicators of other things going on in our bodies. They're supposed to be a nice pretty pink, reflecting good circulation. If there are ailments, poor circulation, congestion of any kind like poor digestion, signs will be clearly shown in different areas of our tongues like the back, sides, tip, and center. Indicators include coatings, pink spots, cracks (horizontal and/or vertical), color tonality, and tremor of the tongue. He share a few pieces of interesting information with me regarding tongue mapping/diagnosis. If a tongue is particularly red in any area of the tongue map, it indicates internal heat in the corresponding organ. The tip of my tongue was red, the lungs/heart region, showing something called "heart fire" which is a condition characterized by trouble sleeping and anxiety (both of which I have and talk about regularly). Potential coatings on our tongues are something not even tongue scrapers can take care of - the coat will reappear in a short time post-scrape. A thin white coat is a healthy sign, indicating good digestion, but a thick, greasy, yellowish coating could indicate an imbalance (source: link). Coffee is also a big kicker with yellowing the tongue. Scalloped tongues (ridges on the outside of it) indicates fluid retention. These develop because the tongue swells against presses on the teeth. Women may notice their tongues becoming slightly more purple during menstruation which I find to be super interesting and will be taking notice of that next week during that phase of my cycle. There is so much information online about tongue diagnosis and mapping, ways to heal and balance your "Qi". Wikipedia says this: Qi translates as "air" and figuratively as "material energy", "life force", or "energy flow". Qi is the central underlying principle in Chinese traditional medicine and in Chinese martial arts. The practice of cultivating and balancing qi is called qigong. Eat organic - chemicals and pesticides burden the liver and promote imbalance of our Qi. Avoid Sugar of any kind as best you can. If you use sweetener, use raw honey or maple syrup in small quantities. Exercise! It's so important to keep our bodies moving. Strive for emotional balance. Failing to release our emotions stagnates the Qi, but releasing what we're feeling promotes balance. Don't be afraid to say how you feel! The Chinese Herbalist/Acupuncturist I'm going to is Luke Pritchard in Westminster, Maryland. You can find out more about him by visiting his website. He studied Chinese Medicine for over 8 years and has brought his knowledge and expertise into dedicated practice. I've learned so much from him in just one session and I'm excited to go back this week.